Blurb: A complete palmistry e-book. 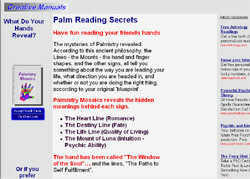 Palmistry Mosaics contains 50 pages of valuable information. It is written in easy to understand language. According to ancient philosophy, the Lines - the Mounts - the hand and finger shapes, and the other signs, all tell you something about the way you are leading your life, what direction you are headed in, and whether or not you are doing the right thing, according to your original 'blueprint'. In Palmistry Mosaics you will learn about these in details. -The Mount of Luna (Intuition - Psychic Ability). -Where did palmistry come from? -Are you following your destined path? -Are you leading an individualistic lifestyle? -Do you have creative writing ability? -Are you popular amongst your friends?